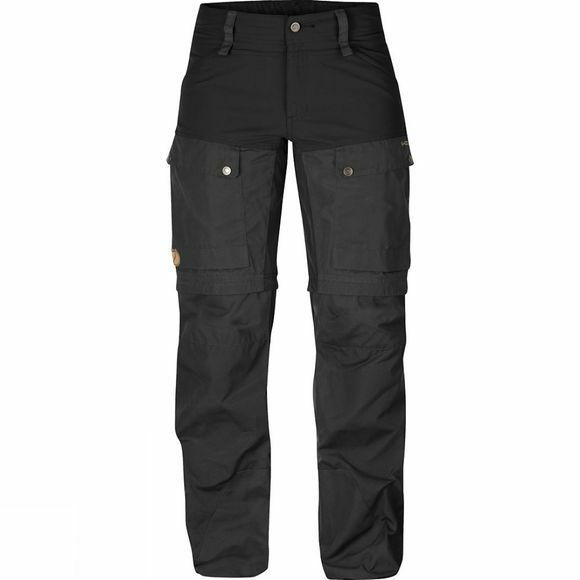 Technically-advanced trekking trousers with optimised fit, carefully-thought-through details and removable gaiters. The rear and knees are preshaped and have extra strong seams. The seams on the inside of the legs have been moved forward to reduce the risk of chafing. A zipped ventilation opening from knee to hip releases excess heat and even the fly has been lengthened for extra ventilation if needed. Two leg pockets with flaps, one of which has an inner mesh pocket for smaller items such as a telephone. The hand pockets are positioned high so contents do not spill out when you sit down. Strap adjustments at the hems and, in addition to the hidden boot hook, the hems are equipped with eyelets to which laces or metal hooks can be attached – yet another way to fasten the trouser leg and prevent brush or snow from finding its way into boots.